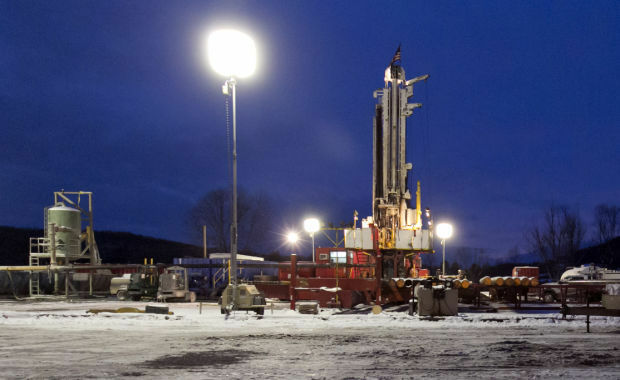 A fracking site is shown on Jan. 17, 2013 in New Milford, Pa.
ENFIELD – In a historic move, regulators from the Illinois Department of Natural Resources Department of Oil and Gas Resource Management on Thursday approved the state’s first fracking permit. Approval of the permit, issued to Wichita, Kansas based Woolsey Operating Company, comes more than four years after former state governor Pat Quinn signed the Hydraulic Fracturing Regulatory Act into law, opening the way for the controversial oil-drilling practice to begin in the state of Illinois. Hydraulic Fracturing, or fracking, is a technique used to enhance the flow of gas from shale formations that are difficult to access due to depth and rock composition. The process involves the high-pressure injection of ‘fracking fluid’ into a well to create cracks in deep-rock formations through which natural gas, petroleum, and brine can be extracted. Proponents of fracking say it supplies needed energy resources and brings with it jobs and economic benefits….